No, not us! My brother is 6 foot tall. Right at the front there, those tiny grey things. No, not the Overlords. Those. I spent some time this week painting up the thumbnail-sized earth men. They scrub up quite nicely, and being so small, quite quickly too. Here’s a scale shot next to an old drinking buddy of theirs. 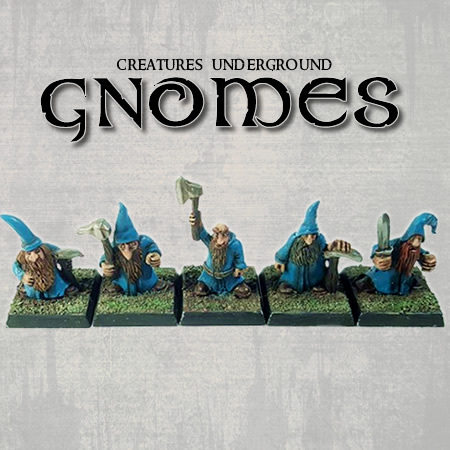 Gnomes will be heading to Kickstarter this weekend – like tomorrow. So, stay tuned. This weekend Krakon Games attended its first proper trade show. 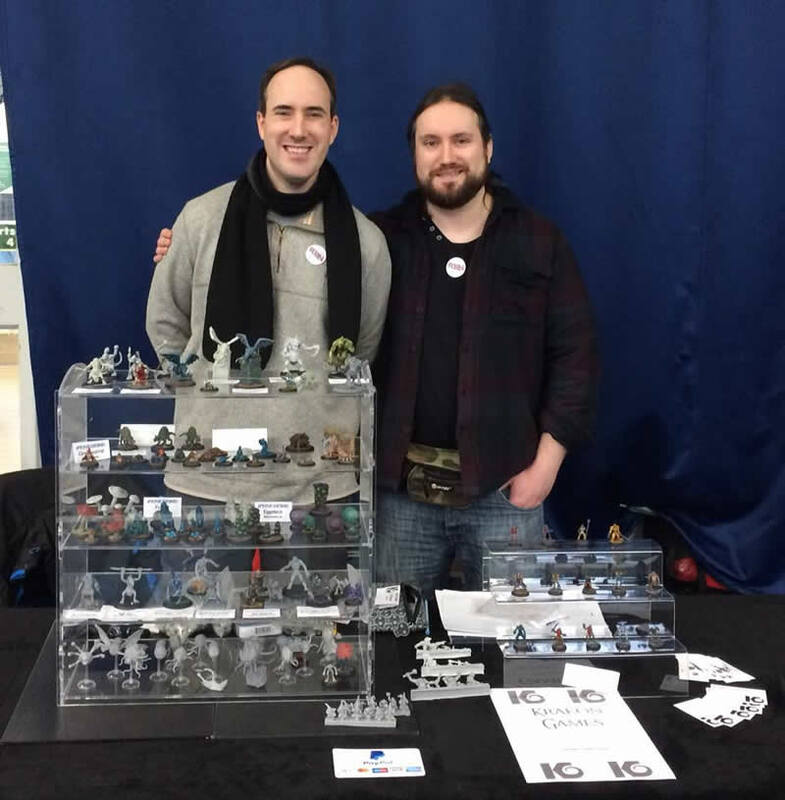 Krakon Games is normally a one-man show (Ross), but my brother (Neil) supports me through suggestions, painting and this year he is helping out with trade shows while I find my feet doing so. Considering he has painted almost my entire range (while I’ve painted next to none of it), this is a huge help. 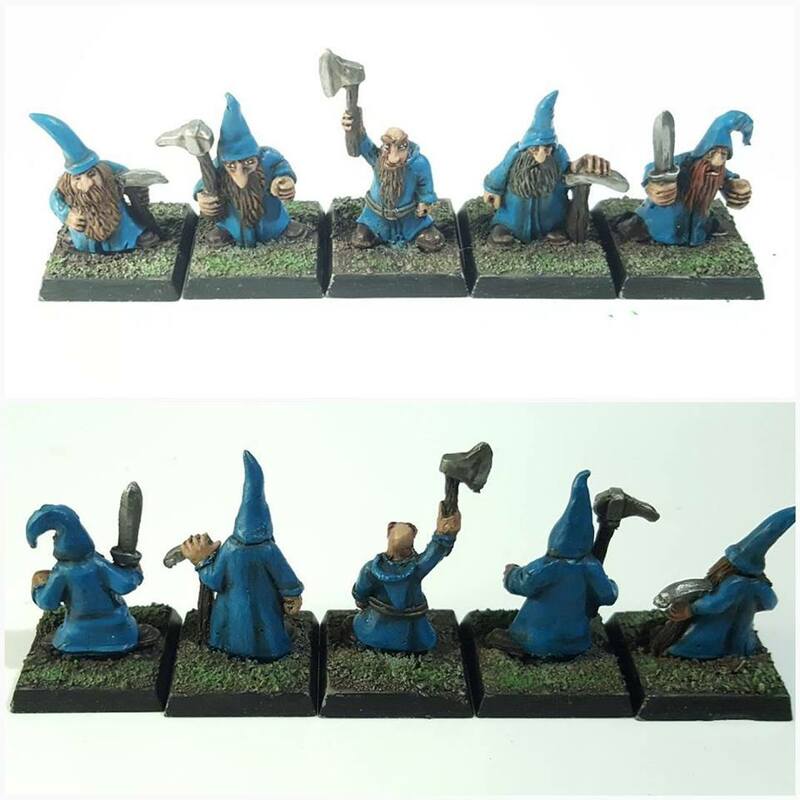 Painted examples of my sculpts look a lot nicer than green sculpts or grey resin casts. ROBIN was a fun experience – meeting customers in person, seeing their reactions, ideas behind their purchases and best of all, their recognition of what I am “doing.” What I am doing is creating models to fill niche gaps in the market. The show was very positive. I was worried my ranges wouldn’t be that well received, but I chatted with so many visitors, my throat is now sore! It was a great feeling to see people’s faces brighten up when the identified what my models are. This year, I am pushing my Online presence and general exposure to the miniature-buying world. You could simply say I am trying to market my product more, which is correct, but I also want to engage with the customers. A lot of what I produce is inspired by ideas from the community. Some models are direct sculpts from submitted concepts. That is something I plan to continue, so please keep engaging with me. Here is one example – the female sump beetle, submitted by Rochie Rochfort. Also, as you can see right now, I am going to try and blog more. Rather than say everything in my head all at once though, this will be the first of a regular blog update for Krakon Games. Stay tuned! It’s easy to get yourself lost in a bundle of projects. It’s been almost year since I’ve posted anything on the website and I have clearly been neglecting Krakon and the product range. There hasn’t been much interest, which is a definite factor in curbing enthusiasm. I would like to start a regular progress and idea blog on here to help get back into the swing of plans and ambitions. Krakon Games is a bit of am umbrella name for all my projects that I wish to release in some form to the public, rather than my personal pieces, so I will make every effort to keep anything you will be able to get hold of within this realm. Expand the base ranges into relevant new base sizes. 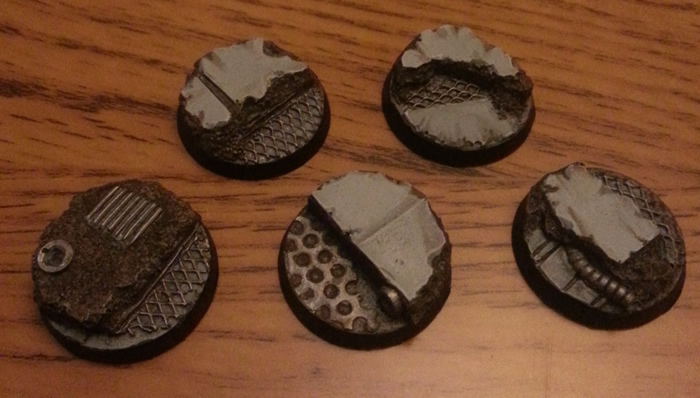 In regards to Sci-fi, this will be 50mm round and small oval for the Xenos range and 32mm round and small oval for the more industrial styles. Explore potential for fantasy round bases – whether to expand on bevel skirmish base ranges, or a new chamfer round range with fantasy theme(s). Design small map-style structures for using with campaign maps and board games. This will include features such as wizard towers, towns, bridges and mines. Plan a base accessory range, including the likes of small familiars, animals, debris and props. The challenge to myself is to look into or work on one of these 4 points each week. In you happen to be local to Salisbury today, make sure you check out the Salisbury Area Wargame Show. The first of its kind in Salisbury, SAWS aims to open up the Wargaming hobby to the community with a good number of display games and sponsor companies offering sample products and promotional codes. We are sponsoring the event, with my brother on hand showing off some of the releases and unrealeased models created by Krakon Games. 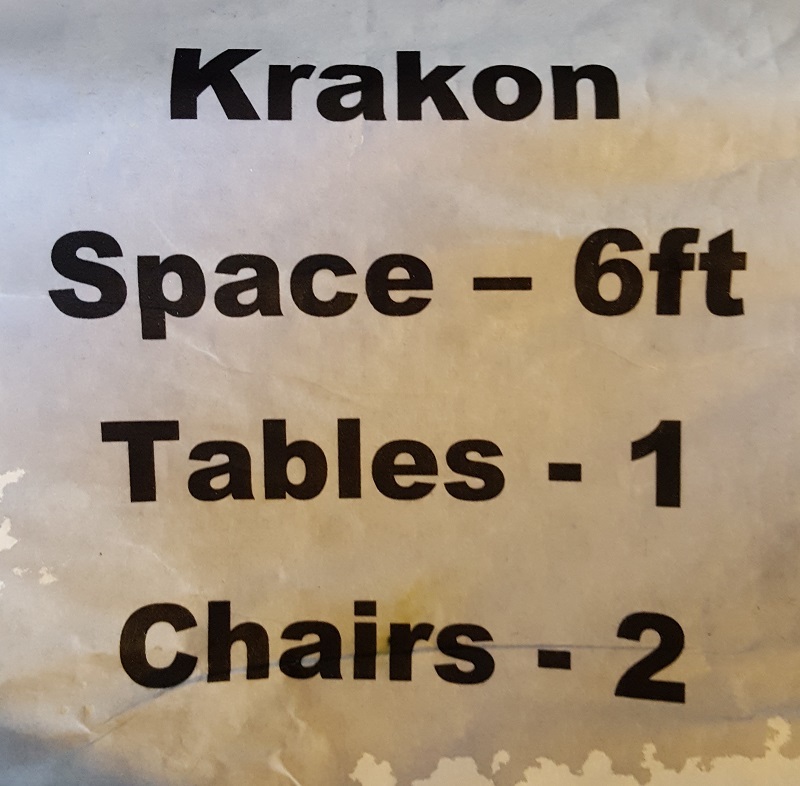 In an effort to prove my seriousness about bringing Creatures of the Night to life, I have founded a suitable company and website name – Krakon Games! The name came to me pretty quickly. I am hugely inspired by Lovecraft art and background. In fact anything involving tentacles is pretty cool in my book. Combine that with the Slavic-heavy inspiration behind my in-development card game, Krakonoš, and you can see how I got to the name. Krakonoš is a card game set in the same universe as Creatures of the Night. I see this as an introduction to my game world, making use of the same environments, creatures and mechanics that exist in the greater world of CotN. My aim is to put out this game, perhaps through a funding platform if it goes well, and get the CotN concept out there. I am not the greatest or fastest sculptor, so planning an entire miniature range to do by myself is bordering upon crazy. 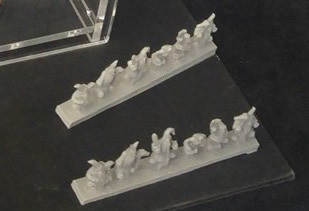 However, the other project is actually the miniature range. I work on this when I get chance, but I do hope to eventually hire out other sculptors to help bulk out the range once I have a ruleset in place. My primary objective is Krakonoš for now. I am able to work on this a lot as it’s mostly document editing that can be done anywhere (thanks to my phone!). I am hoping to put together a rough prototype and begin playtesting in September. This is the first big step should help steer and fine tune the card game.